Is there anything sweeter than a brand new baby wearing ruffles?! I think not ;). 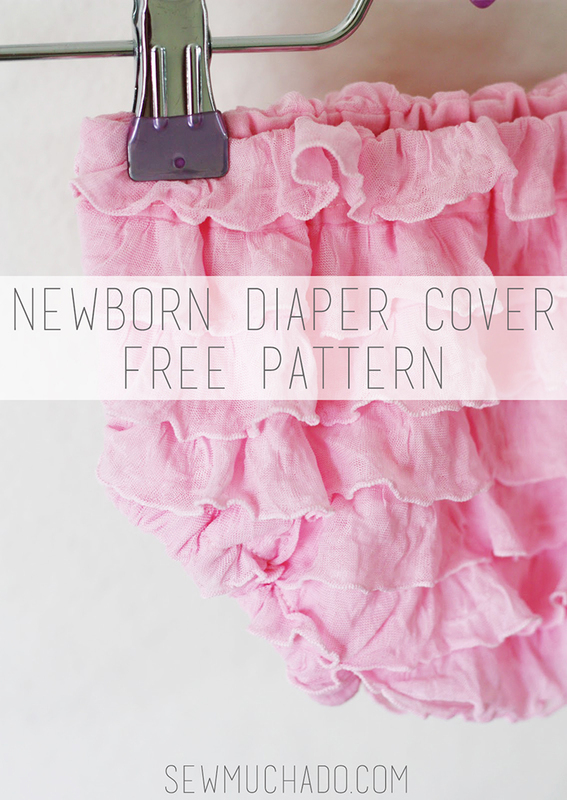 Today I’m sharing a Ruffle Fabric Free Diaper Cover Pattern with you so that you can make your own! It’s perfect for photos, under dresses, or on it’s own for those in hot enough climates where shirts are optional, hehe. We are soon to add a baby girl to our family, and I can’t imagine anything sweeter than newborn photos with a little girl wearing a ruffly diaper cover. 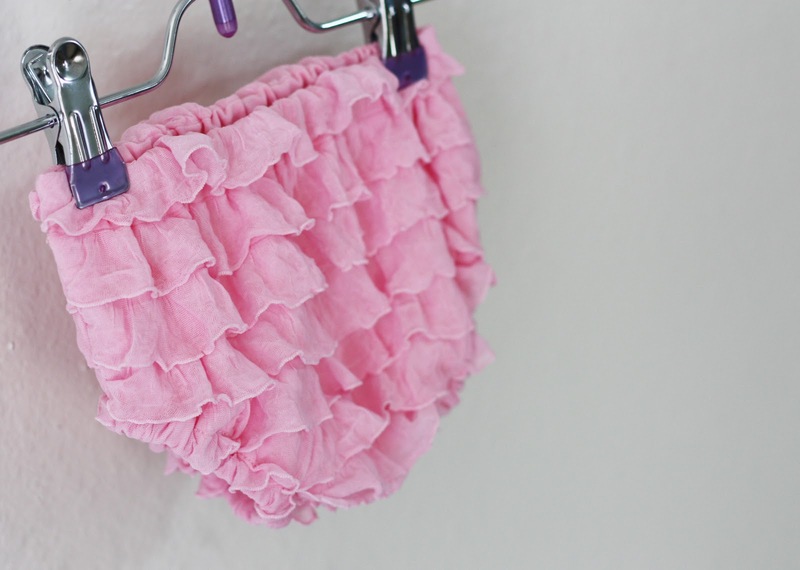 I’ve heard from many of you who are also expecting a girl this spring or summer, and wanted to share this free pattern with you for a Ruffle Fabric Diaper Cover! As newborn photos are usually taken within the first week or so after birth, this pattern is sized to fit a baby up to 9 pounds. But, since ruffle fabric is stretchy and super forgiving when it comes to sizing, many babies will be able to continue to wear the diaper cover for their first few months. Click HERE to download and print pattern pieces. 1. Print pattern pieces. Ensure your printer is not set to scale the pattern. Cut pattern pieces out along solid and dashed lines and tape together along dashed lines. Normally a diaper cover could be cut on the fold, but since ruffle fabric is a bit trickier to cut out (I’ll give some specific tips below), we’re going to use a full pattern piece that’s not on the fold. 2. Lay pattern pieces on ruffle fabric and cut out as directed, aligning top of pattern pieces just below point where one ruffle is attached (flip that ruffle up and out of the way while cutting). This will give enough width of non-ruffled fabric to use for the waistband casing. When cutting the sides and curves of each piece, make sure that the ruffles are always laying flat as they would naturally fall. When cutting the bottom of each piece, flip the ruffle nearest the bottom up so it does not get in the way of cutting. * Since ruffle fabric is a knit, always use a ballpoint needle. 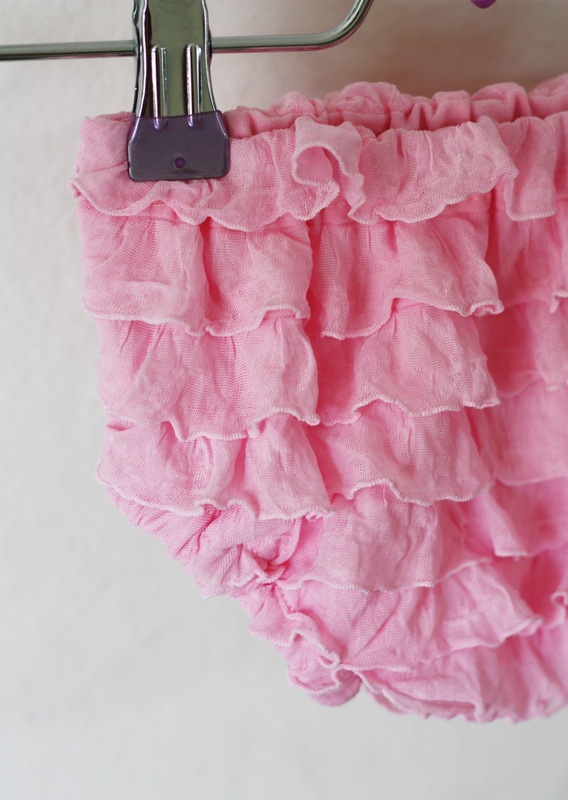 * Before pinning and sewing ANY seam, always make sure every ruffle is laying flat and in place. Sewing in the direction that the ruffles are laying will help them to stay put while being sewn (example: sew the side seams from the top of the diaper cover towards the bottom). * Pin, pin, pin! I can’t say that enough, especially on any curved edges, where it’s more difficult to keep the ruffles in place as their sewn. * Don’t stretch the fabric as it’s sewn. Allow the feed dogs on your machine to gently guide fabric through. * Sergers work great with ruffle fabric, but I like to sew the seams with a sewing machine first and serge afterwards to give myself the opportunity to unpick any areas where the ruffles might have gotten out of place when sewn. Do what works best for you :). 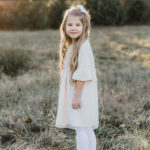 * Ruffle fabric raw edges will not fray, so if you don’t have a serger, you can just leave the raw edges after they’re stitched – no need to zigzag. 3. Pin and stitch front and back pieces together at sides and bottom edges, leaving leg holes open and using a 1/2″ seam allowance. The ruffle nearest the waistband should be flipped upwards toward the top of the diaper cover while sewing the side seams (I didn’t do this, but I’ll explain why you should in a later step). When stitching the bottom seam, you may have to decrease your seam allowance to avoid stitching into a row of ruffles – I only had about a 1/4″ seam allowance on the bottom in this case, but use 1/2″ if you can. Your ruffles should be laying nice and flat (your top ruffle will be facing upward though, right?). 4. Turn top of diaper cover 3/4″-1″ (depending how much fabric you have before the next row of ruffles) to the wrong side and pin in place, with the first row of ruffle flipped upward and out of the way of the pins. 5. Stitch close to edge of pinned waistband, forming a casing for elastic, and leaving an opening to insert elastic. 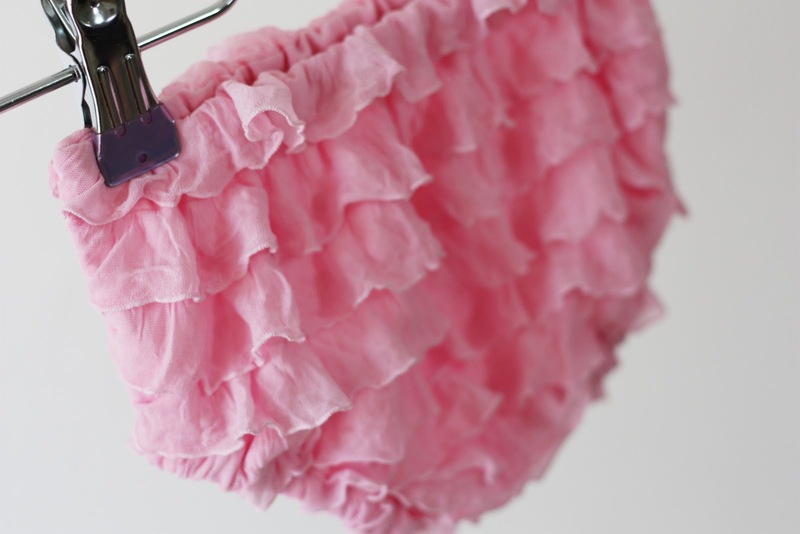 Pay special attention to keeping ruffles out of the way of the seam. 6. Pin one leg opening 1/2″ toward wrong side of fabric, using plenty of pins to keep ruffles in place. 7. Stitch close to edge of pinned edge, forming a casing for elastic and leaving an opening to insert elastic. It’s tricky to keep the ruffles perfectly in place as you sew around the curves, so chances are you’ll have a few areas of imperfection where the ruffles got caught up. The good news is that once the elastic is in, no one else will know, so don’t worry a whole lot about it (for the record, it pains me to say that). 8. Repeat steps 6-7 with remaining leg opening. 9. 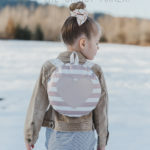 Use a safety pin to insert a 8″ piece (you can adjust the length of elastic based on the size of your baby’s thighs – take off a bit for an extra tiny baby, add a bit for a chubby baby, or if you want the cover to fit longer, you may also want to add a bit extra length) of 1/4″ elastic into casing of one leg opening. Overlap elastic ends 1/2″ and sew together using a zig zag stitch. Repeat with other leg opening and stitch opening of each casing closed. 10. Use a safety pin to insert a 14″ piece (again, adjust the length as needed) of 1/2″ elastic into waistband casing. Overlap ends 1/2″ and sew together using a zig zag stitch. Stitch casing opening closed. Great work! Your diaper cover is ready to be worn on a cute little behind :). I’m excited to share some pics of our little one wearing her ruffle fabric diaper cover when the time comes, but in the meantime, please share pics of your covers in by tagging @sewmuchado and using #sewmuchado on Instagram – I’d love to check them out! This is so adorable…..it’s going to make your already-no-doubt-cute-as-can-be baby even more irresistable! Am I blind? I don’t see the pattern anywhere! Haha, no worries! You can find the link to the pattern right under the materials list :). These are soooooooo cute! No easier way to get that little ruffle bum! Thanks for sharing! How cute is this!! Thanks for posting the tutorial. Okay these are adorable, and they just made me super baby hungry…Thanks a lot! Abby I’m loving all of the amazing things to do with ruffle fabric…these are beyond adorable! That’s just too cute! I’m pinning it now. sew cute!! !Love it….That stuff makes it all so easy…..!!! So stinkin’ cute! I’m sure I’ve said it before, but seriously…what a lucky baby girl! Thank you so much for this post. I want to let you know that I posted a link to your blog in CBH Digital Scrapbooking Freebies, under the Page 4 post on Feb. 11, 2012. Thanks again. Eek, that is too cute! Great tutorial! Adorable! I just saw some of this fabric and wondered how to sew with it! Thanks to your great tutorial, it looks much easier than I thought! 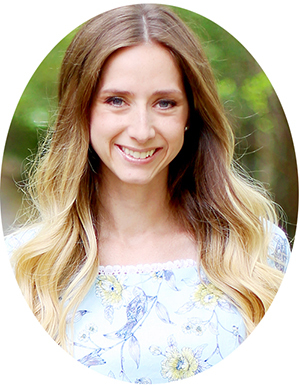 I would love it if you would come link up with Busy Monday (through Thursdays) at A Pinch of Joy, a linky party for ideas that make life better. Love this!! Thanks for the pattern & tutorial. Oh, wow, those are just adorable! Super cute and fairly quick project! 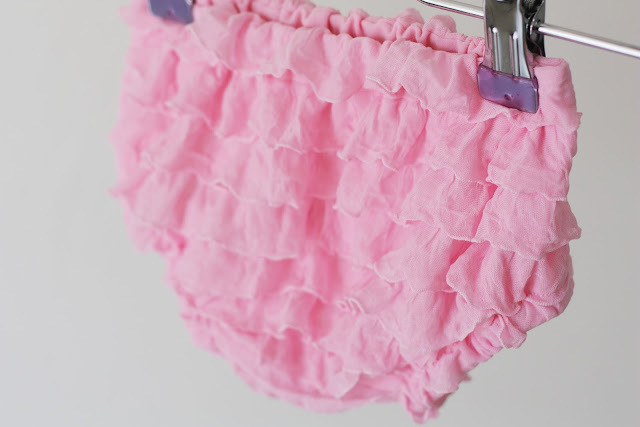 It will be a great guide even for making my almost 2 year old some bloomers. Thanks for sharing. Great use for ruffle fabric. 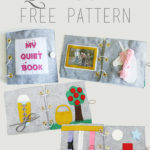 Would love to feature this if you added the Craftastic party button to your party page. Thanks for linking up & looking forward to seeing what you link next. I REALLY, REALLY wanted to thank you for your generous tutorials!!!!!! I am a beginning sewer and your step by step and tips help me to be successful! I want to upload a pic of the ruffle bum I made and also a baby blessing dress I made from your tutorials! I rarely comment, but I had to… I MUST THANK U so much for being so generous in posting tutorials!!!!!! Would you happen to have a pattern for 18 months bloomers? I am going to try to make some of these for my future great granddaughter (after I find out the baby is a girl)! My granddaughter is expecting her first baby in June and even with the girls in the family I have never made ruffle diaper covers so I am looking forward to this and also thank you very, very much for all the tips and tricks to do this! Is there an easy way to print or save the tutorial? Hi Teena! The easiest way would be to copy and paste the instructions into a word document. Can I make these with non ruffle fabric? I made a few of your peasant dresses for my coming baby girl and wanted to make some matching diaper covers to go under them. The fabric I used for the dresses is basic cotton quilting fabric. You sure can, but the pattern is designed for knits, so I’d stick to knit fabrics :).